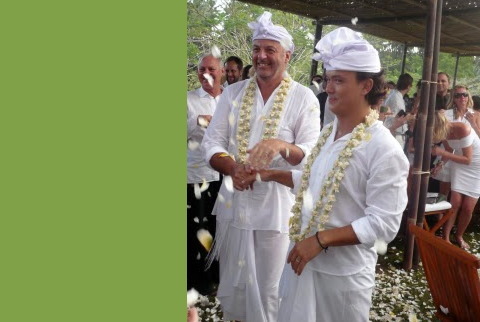 I was contacted a few months ago by a niche events organiser asking if I would provide a cultural morning in Ubud for a celebrity wedding in August. I always welcome the opportunity to infect influential people with my incurable passion for all things Balinese, and this particular party was heavier with heavy influencers than most. It was the wedding of Jonathan Rutherfurd Best, London’s longstanding maestro of fine fêtes, fine food, and all manner of general capriciousness (above). The ceremony itself was held at Linda Garland’s estate (below), and several hundred guests were accommodated there and in various villas and hotels round about for a week or so to celebrate the occasion. After a knock-down-drag-out welcome luncheon for legions of global glitterati lasting until well after midnight, (as knock-down-drag-out luncheons will do), we slept like the dead the whole way home in the car, and the next morning rose early to infect a phalanx of guests with a bit of Bali mojo. I’d roped my friend Tjok Raka Kerthyasa into providing a palace welcome and private tour of the sancta sanctorum of his family, the inner courtyards of the the Ubud royal palace. We planned it for ten or twelve guests, but seventy turned up bright and early and bleary eyed, in spite of inclement weather. Tjok Raka then proceeded to charm the designer pants off of all present. He’s good at that. As a co-ruling prince, and Bendesa Adat of Ubud (grand poobah of all things traditional and religious), and as a member of the Bali parliament, he is uniquely qualified to transmit the stories and spirit of Bali as it is manifested in Ubud. And so he did. Seventy pairs of bloodshot eyes were locked on Raka for over an hour, as he delved into the complexities and nuances of life in a post-modern rajadom with pre-modern traditions. The tour led us through many closely guarded corners of the Ubud royal compound, where guests met a plethora of palace pooches, pembantus (housekeepers), and pengayah (retainers). 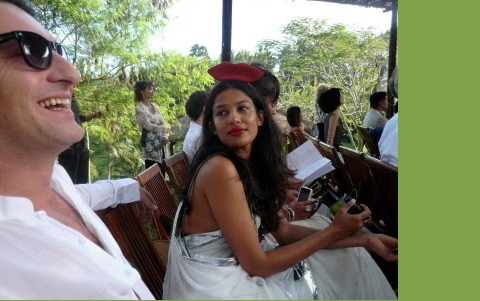 Raka regaled them throughout, with sound-bite-sized outlines of the esoteric elements of Balinese Hinduism. He left the throng enthralled and begging for more, as he bid us farewell and jumped into a modest economy car (self-drive) to rush to his next official appointment. Applause and awe swept through the palace forecourt. Guests were then herded down Monkey Forest Road to Macan Tidur gallery for a rollicking runthrough of Indonesian history from the bronze age to the information age, illustrated with textiles and artefacts from all over the archipelago (and a good Indonesian schoolroom map). Then they were whisked off to John Hardy’s for lunch. The next day, the “black-and-white” themed ceremony and celebration took place on the lawn at Linda Garland’s. Guests included figures of film, fashion and television from New Zealand, Australia, Hong Kong, Thailand, America, Europe and the UK. Including, lest we forget, the divine presence of Olivia Buckingham (above). All in all several hundred of the groom and groom’s very closest friends came to Bali to wish them well and enjoy a week packed with parties and activities all over the island. I honestly hope they went away with positive impressions of Bali, and it would seem so. The event was blogged positively by Saloni Lodha of Vogue (above), London stylist Susan Bender (below), and Thai designer Chomwan Weeraworawit. And not one single paparazzi was in evidence. Bali remains one of the few places left in the world where celebrities can enjoy a relaxing holiday without dodging cameras and microphones. I hope it stays that way. I just put up a private album on facebook with pics from the inner sancta of the puri. Will send you a link. Gus Dark, of course is spot-on. Had these fine fellows been fully advised by a few folks with a clue, they certainly would have delighted in complying with every element of indigenous propriety deemed appropriate. Info goes both ways . . . I agree, I wish Bali will stay the same - a place where people can still enjoy their privacy - i believe that private weddings are more solemn than weddings with cameras in all direction.